As Afghans mourn the victims of a truck bombing that killed 90 people, there are additional fatalities from a demonstration in Kabul for better security in the Afghan capital. A member of Parliament from Kabul says eight protesters were shot and killed by government security forces during Friday's demonstration. But Kabul's police chief said two protesters were killed, and that 25 police officers were wounded by rocks thrown from demonstrators. One protester says a number of his friends were beaten with sticks by police, and others were detained. He says it shows that "peaceful demonstration would not be useful anymore." More than 1,000 people demonstrated, some holding pictures of destruction from Wednesday's the truck bomb blast and of government leaders. Officials have said most of the casualties from the truck bombing were civilians, including women and children. The dead also included Afghan security guards at facilities including the U.S. Embassy. 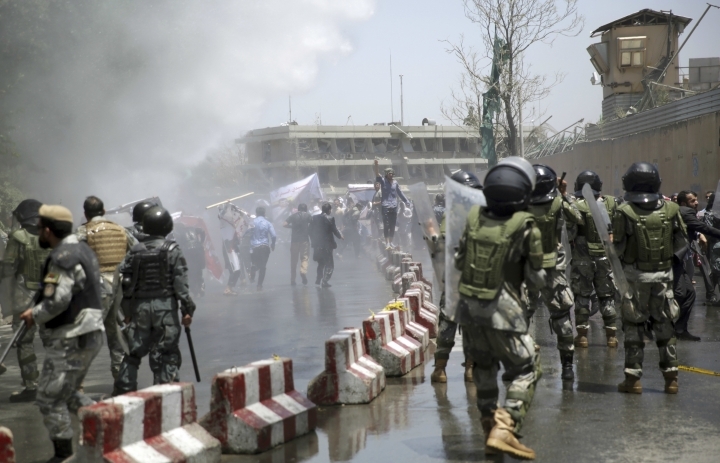 Authorities say several protesters are dead and at least four police are injured as hundreds of people demonstrate in Kabul for better security in the Afghan capital. More than 1,000 people were taking part in the demonstration Friday in the wake of a powerful truck bomb attack that killed 90 people on Wednesday. Abdul Hafiz Mansur, a member of Parliament from Kabul, says eight protesters were killed by government security forces. Policeman Ghulam Hazarat said four police were wounded by stone-throwing protesters. Demonstrators held pictures of the destruction from the blast and of government leaders, and police fired warning shots as about a hundred demonstrators rushed toward them, some throwing rocks. A security forces tank fired warning shots into the sky. Afghans are in mourning after the massive truck bomb killed at least 90 wounded more than 450 more in one of the worst extremist attacks since the drawdown of foreign forces in 2014. No one has claimed responsibility for the attack. 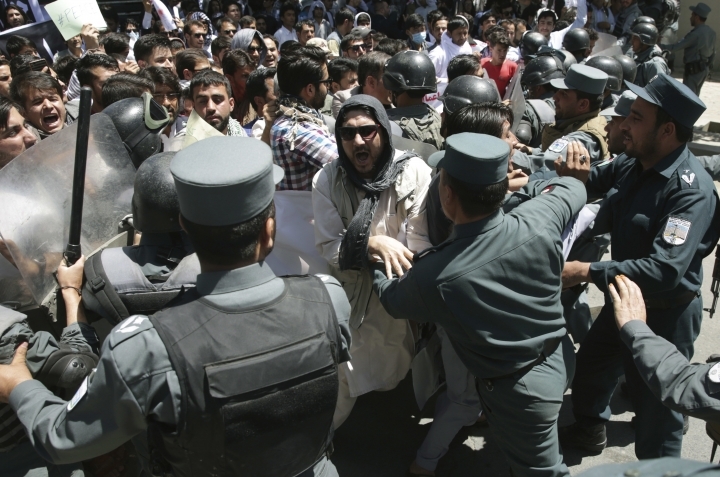 A policeman tells The Associated Press that at least one protester is dead and four police are injured as some 500 people protest in Kabul for better security in the Afghan capital. The demonstration comes in the wake of a powerful truck bomb attack that killed 90 people on Wednesday. Policeman Ghulam Hazarat says that one civilian was shot and killed by police and four police were wounded by stone-throwing protesters. Demonstrators held pictures of the destruction from the blast and of government leaders, and police fired warning shots as about a hundred demonstrators rushed toward them, some throwing rocks. Police are firing into the air and demonstrators are throwing rocks at them as some 500 people protest in Kabul for better security in the Afghan capital. Shopkeeper Mohammad Anwar said Friday that four members of his family were killed in the attack. Anwar says: "We are calling on President Mohammad Ashraf Ghani to resign." Demonstrators held pictures of the destruction from the blast and of government leaders, and police fired their weapons into the air as about a hundred demonstrators rushed toward them, some throwing rocks. Some 500 people are demonstrating in Kabul for better security in the Afghan capital in the wake of a powerful truck bomb attack that killed 90 people. Shopkeeper Mohammad Anwar said Friday that four members of his family were killed in the attack two days earlier. Anwar says: "We are calling on President Mohammad Ashraf Ghani to resign." Demonstrators held pictures of the destruction from the blast and of government leaders, and police fired their weapons into the air as about a hundred demonstrators rushed toward them.